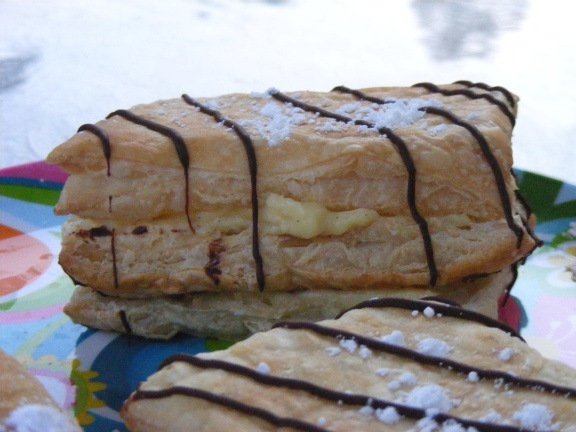 Being rustic, these Napoleons were fairly easy to whip up. I sliced a sheet of thawed frozen puff pastry into six equal pieces and baked them. After they cooled, I divided each rectangle in half horizontally for a total of 12 pieces. Then, I simply layered the puff pastry sheets with vanilla bean pastry cream, drizzled the tops with melted dark chocolate, and let them chill for an hour before serving. Voila! Rustic Napoleons. A perfect pairing of crisp and savory layered with luscious, creamy, and sweet. Place milk and cream in a medium saucepan. Slice a vanilla bean open with the tip of a paring knife and scrape some of its beans into the milk and cream; add the bean as well. Heat the mixture over medium heat just until everything begins to steam. In another medium saucepan, stir together the sugar, a good pinch of salt, and cornstarch. Remove the vanilla bean from the cream and milk, and in a thin stream, pour the liquid into the the sugar mixture, stirring constantly. Return the saucepan to the heat and cook over medium, stirring constantly, until the mixture thickens. Stir the egg yolks together in a bowl. In a thin stream, stir in about 1/4 cup of the hot mixture into the yolks, then scrape the yolk mixture into the saucepan. Return to heat and bring to a gentle boil, stirring constantly until the mixture is thick and smooth. Transfer the custard to a bowl and cover with a piece of plastic wrap touching the entire surface of the custard. Chill until needed.